A brochure advertising 'Claverack', the Thomas H. Barber estate designed by Robert Henderson Robertson c. 1892 in Southampton. 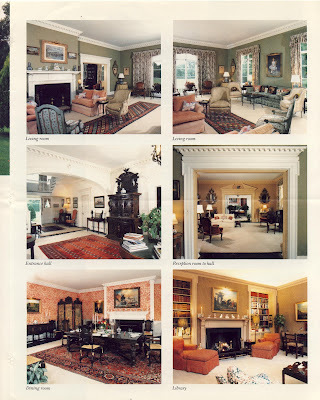 Click HERE to see the brochure from when the 'Claverack' was for sale the first time. Click HERE to see 'Claverack' on google earth and HERE on bing. 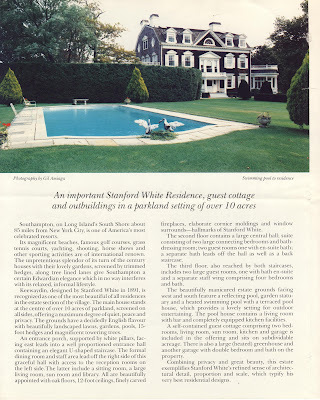 And yes I ignored the fact they credit this house to Stanford White. I'll take it. Those rooms look as good today as they did when the photographs were taken 25 years ago. Good, conservative WASP decorating (with a bit of an edge) never goes out of style to my mind. 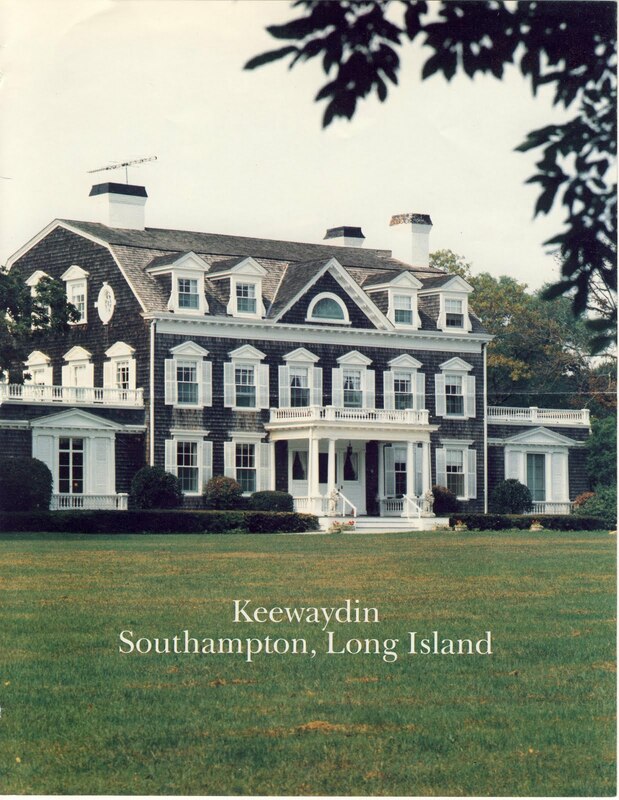 The news on the Rialto is that Keewaydin was just sold by its most recent owner, Anne Eisenhower Flottl, grand-daughter of a President with the same name and wife of a dodgy German "business man" to the hugely succesful son of the late Nan Kempner. The property was apparently being offered in several lots to attract the typical buyer of today who wants a huge house, but has no idea or appreciation of or for the balance of house footprint to plot size. Mr. Kempner has, I am told, bought the whole "kit and kaboodle", saving Keewaydin for a time, at least. 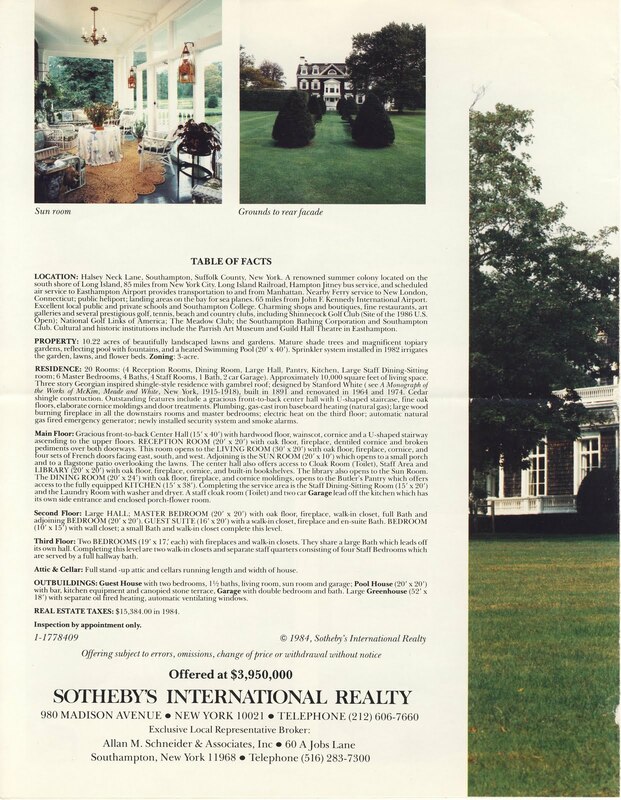 Yes Zach, very clever of that Sotheby Realtor to cite an actual book about McKim, Meade, and White when giving architectural credit to Stamford White but omitting to say WHERE in the book the one would find this house (because it isn’t there). For some reason I’ve grown to despise that dirty McKim & Meade – it seems they worked that poor Stamford to the ground … it’s a wonder he found time to frolic with Evelyn Nesbit. As I’ve said before – great house, glad it’s escaped subdivision again. “… the typical buyer of today who wants a huge house, but has no idea or appreciation of or for the balance of house footprint to plot size” – Magnus, no truer word. I notice that they refer to this as the South Shore of Long Island. When did they start referring to this as "The Hamptons"? 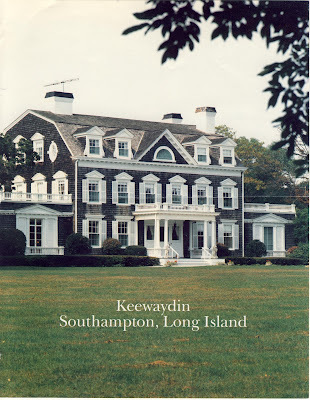 I adore these type of homes, which I always have associated very fondly with the Hamptons since I was a child. I'm glad to hear the current owner will keep it in tact..a rare luck these day's concerning these works of art. 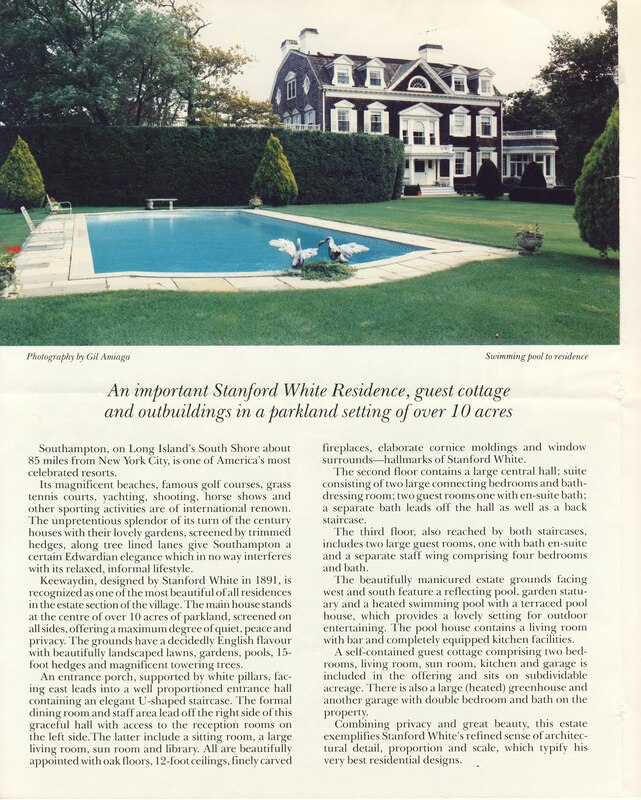 Let's be fair: Perhaps the Oldstead Brothers persuaded Stanford White to design a swing-set for the original owners. Did the Robertsons have teenage girls? BTW, it's pretty shocking to compare the picture of the house "then" and "now." Nowadays, it's insanely crowded, but it could be much worse -- which goes to magnus's point. and speaking of crowded, i think if they had not put those shutters on, they could have crammed another window, maybe two onto that facade. maybe its just the paint scheme but those front and back panels look pretty crowded to me. altho i like that weird tower thing and i'm glad to see it preserved and with a little bit of land, i can't say this is one of my faves even with semi spectacular interiors. i see DED made no comment as this house has no circular forecourt. security word def - "aversers" - those people who don't mind having a huge house with ten other houses within spitting distance. The shutters are kind of close but that's partly because there is a generous supply of large windows. & because of previous comments made in previous posts (meaning I don't remember who said it first)I admire all the previous owners' collective wisdom in staining, not painting.